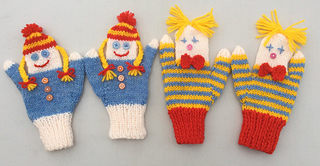 This pattern gives instructions for two different designs of fun puppet mittens for children - Doll and Clown. Each design is available in three sizes, to fit children from 2 to 7 years old. The mittens are knitted flat and seamed. Buttons are used for decoration, but if knitting for small children you may prefer to replace these with embroidered features for safety.